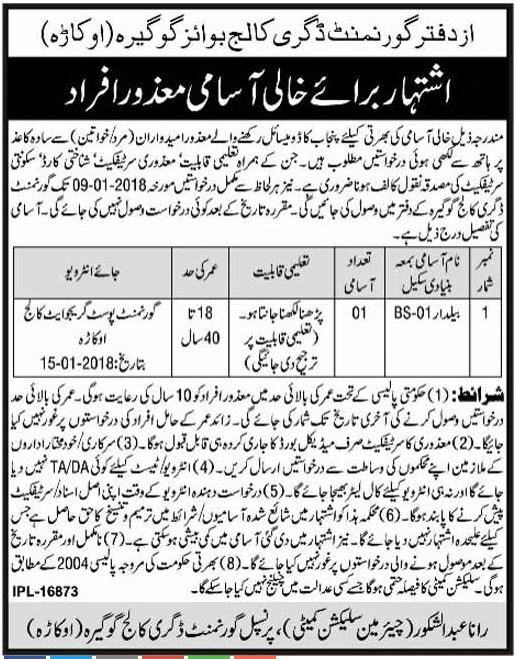 Government Degree College Gogerah (Okara) has announced New Vacant Post of Baildaar (BPS-01) in Daily Dunya Newspaper dated 22nd December 2017. Candidate must be literate; however higher education will be given preference. Written application is required on simple paper, as well as, the candidate will be given 10 Years upper age relaxation owing to government Policy. Disabled certificate is also necessary to apply this post issued by government medical board.